Sense is a new device that helps you get a good night's sleep, tracking your time away with the fairies and waking you at the optimal time. Sleep tracking has been a big part of activity trackers like the Jawbone UP24 or the Fitbit Flex, but Sense is a new device that sits by your bed and works exclusively on giving you a good night's rest. It does this by connecting via Bluetooth LE to a Sleep Pill that connects to your pillow and monitors your tossing and turning in order to assess when you're sleeping most soundly. It will also monitor your sleeping environment by tracking the amount of dust or pollen in the air as well as light filtering into the room. What's more, sudden loud noises are picked up and recorded on the device's built-in microphone. All the information gets relayed to your Android or iOS device via the Sense app. Come morning time, the device will act as an alarm but will wake you up when you're out of REM sleep so as to give you minimal disruption and, hopefully, let you start the day as refreshed as possible. 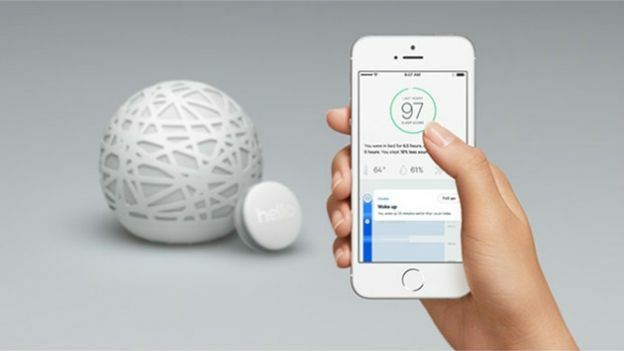 The Sense is the product of San Francisco-based Hello Inc. and had a target of $100,000 when it launched on crowdfunding site Kickstarter. At the time of writing, it had already hit well over $650,000. The project is due to arrive to early-bird backers in November, while the rest of us will likely have to wait until next year to get our hands on one. Check out the video below for more information on the Sense project.